There has never been a more critical time to engage our friends and neighbours in the battle to save our Coast and our climate. This spectacular film presents such an opportunity, and will appeal to all who love our ocean. The Salish Sea has become a flash point for the struggle to maintain fragile marine and coastal ecosystems in a world of rampant development and resource extraction. This film looks below the mirror of the ocean’s surface to explore some of the living treasures that inhabit the second largest “inland” sea in North America. It also examines powerful undercurrents of resistance which have welled up in this time of climate crisis. 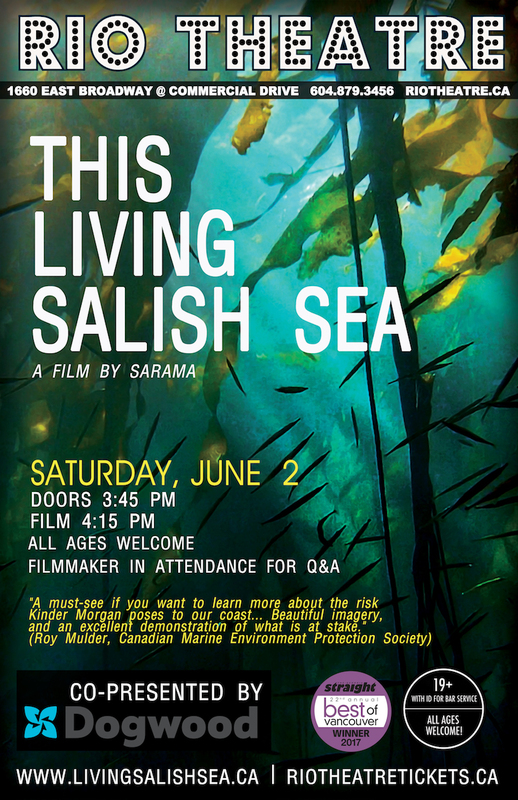 People in the community who are unfamiliar with the issues underlying the proposed Kinder Morgan expansion will learn what is at stake as filmmaker Sarama share his intimate knowledge of the majestic ocean that surrounds us. We hope you can join us for this immensely enjoyable and moving film. Please reach out to your people to take part in this enlightening romp – both above and below the surface of the incredible Salish Sea! Admission is $10 in advance or $12 at the door. Proceeds will benefit the Land Defenders on Burnaby Mountain in their legal proceedings. Tickets and more information are here. for Q and A following the film.